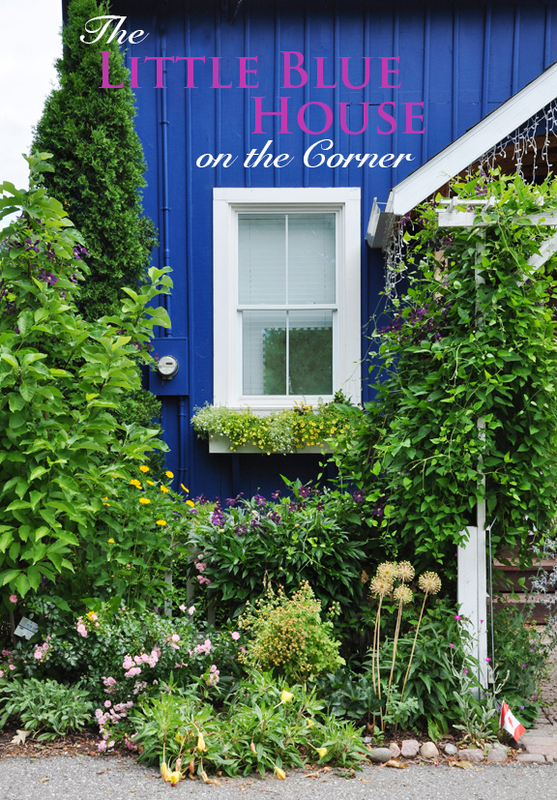 If the vibrant blue color of the house on corner of Victoria Street doesn't grab your attention, the charming cottage garden certainly does. 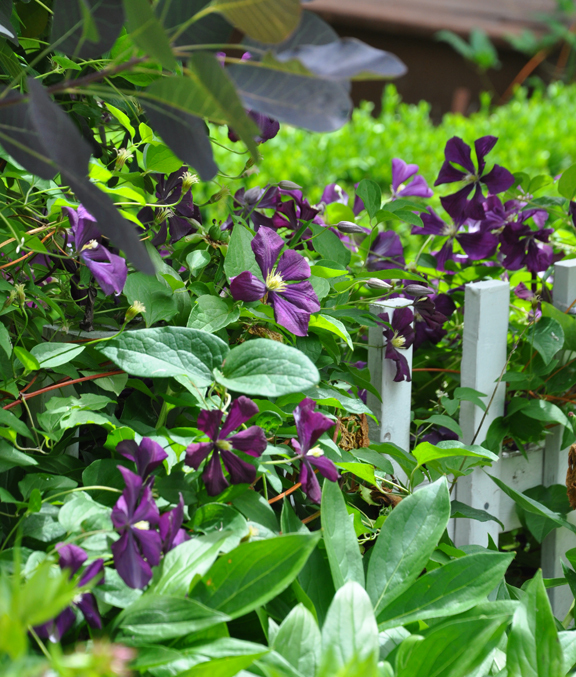 Bright annuals overflow the window boxes and flowers spill onto the sidewalk in front of the white picket fence. 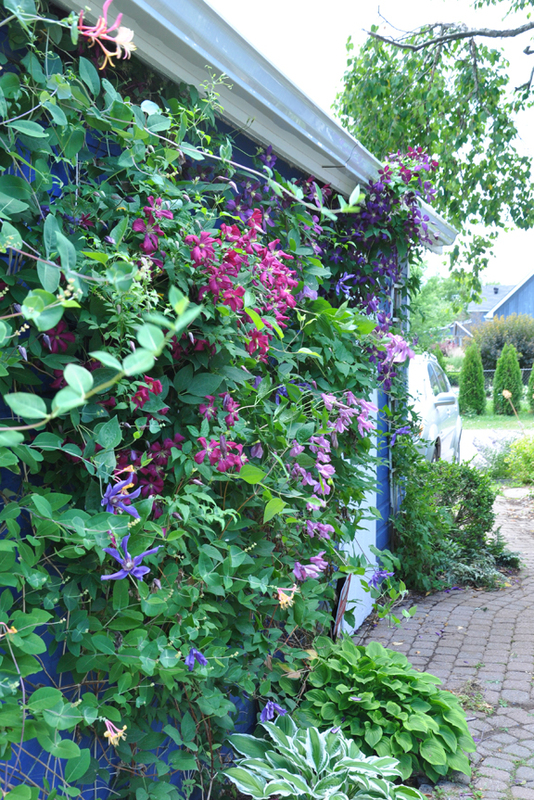 As a whole the exterior is so distinctive, you don't have to pass through the front arbor, smothered in Clematis vines, to know that someone creative lives there. 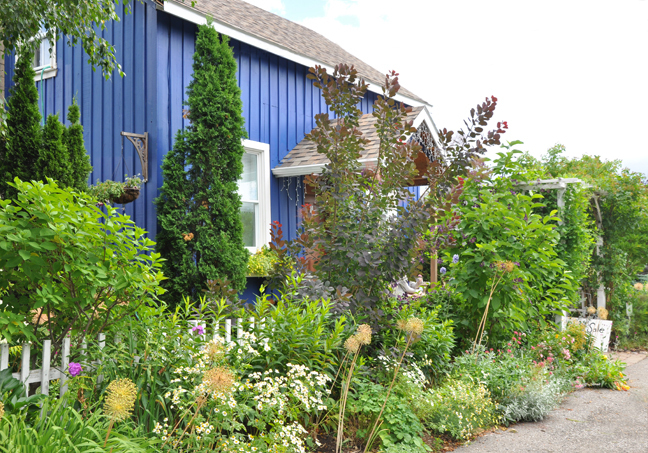 "Blue is my favourite, but the idea to paint the house a bright blue comes from trips to the East coast and Sweden, where they prefer vibrant colors over the boring, bland colors that we tend to use here in Ontario," homeowner Candace Carter says, "In the beginning there were reservations expressed by the neighbours on the blue, but now they seem to like it. 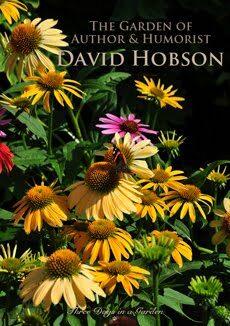 I have had many compliments on the choice, especially from photographers, who like the vibrant color as a backdrop to the flowers." 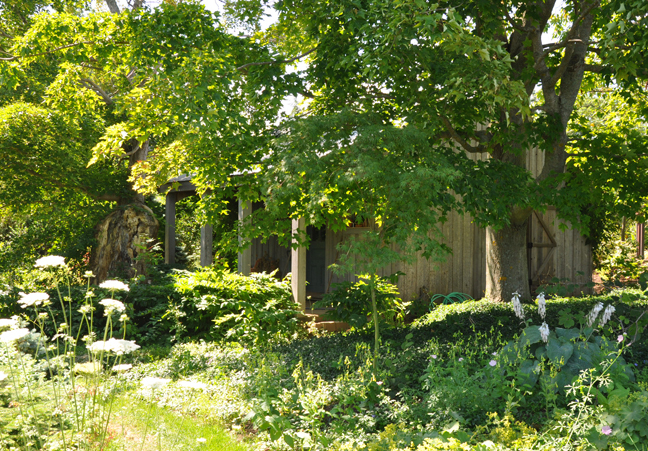 The simple structure dates back to the 1860's and is one of the first homes built in Claremont, Ontario. Candace and her dad did most of the work to update the house for a modern family; adding an extension which now holds the kitchen and dining area. 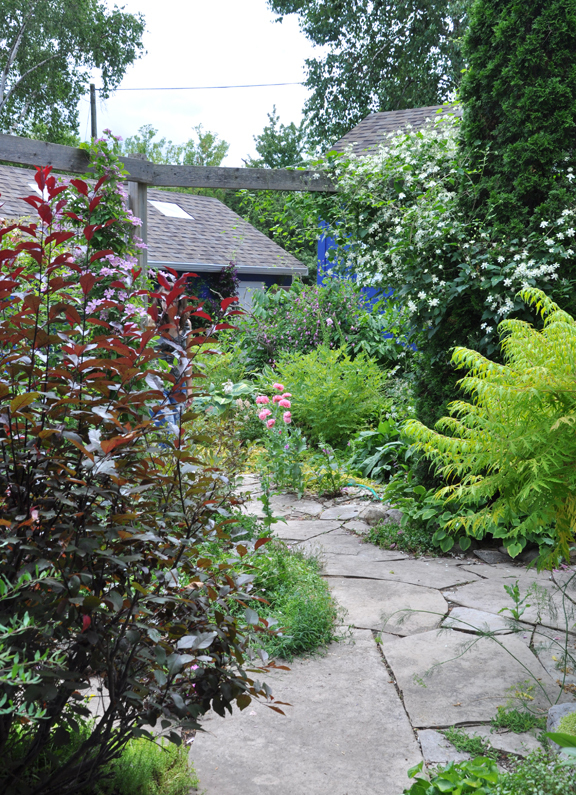 The garden, that surrounds the house on all sides, has been years in the making. 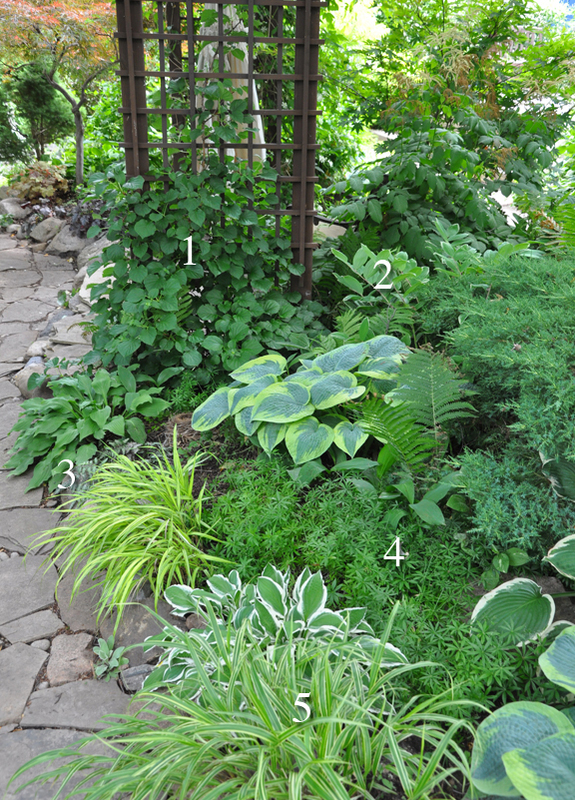 "I had a vision of the main layout and the types of plants I wanted to grow, but the garden evolved over time. I made 'upgrades' as my budget allowed," Candace says. "The first thing I did was remove the grass, which was the only thing here, besides the large birch trees, when I moved in. Then, I laid out the vegetable garden in the sunniest spot of the yard. 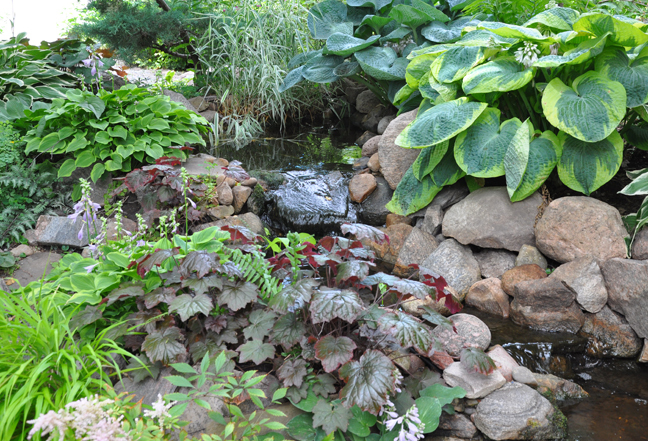 Next, I tackled the shady area around the trees and the small 'river' pond. After I installed the white picket fence and two arbors, I added gardens at the front and side of the house." 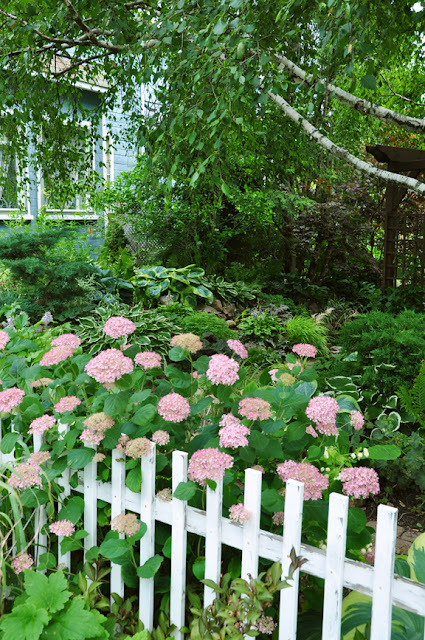 We'll begin our tour, by looking at garden along the front of the picket fence. 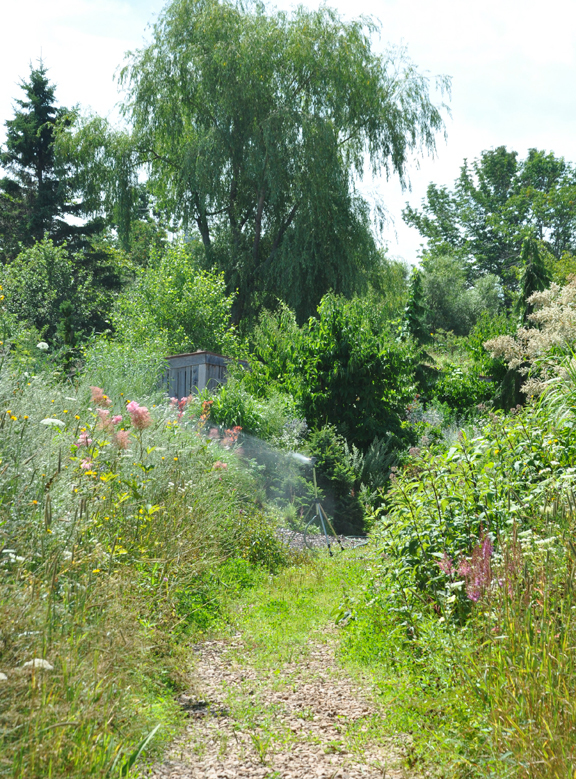 Then we'll head in to the yard to see the shady area and pond tucked under the birch trees. 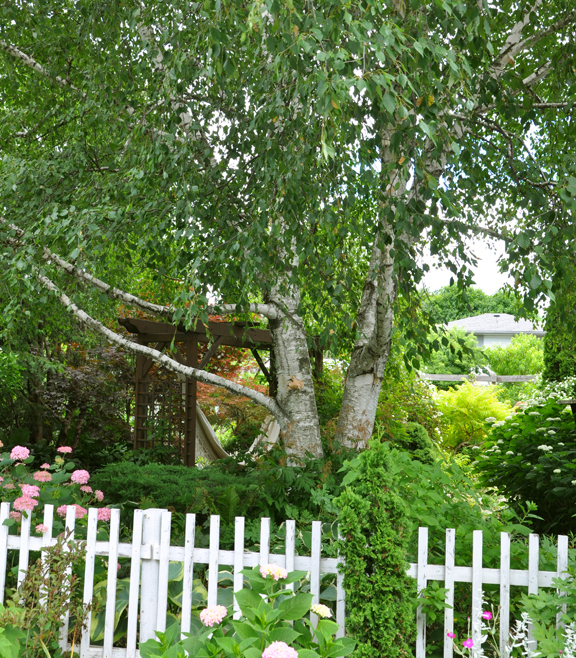 This is the pair of Birch trees that shades the far corner of the garden where we are heading next. Just inside the fence, a brick path that takes us to our first destination. 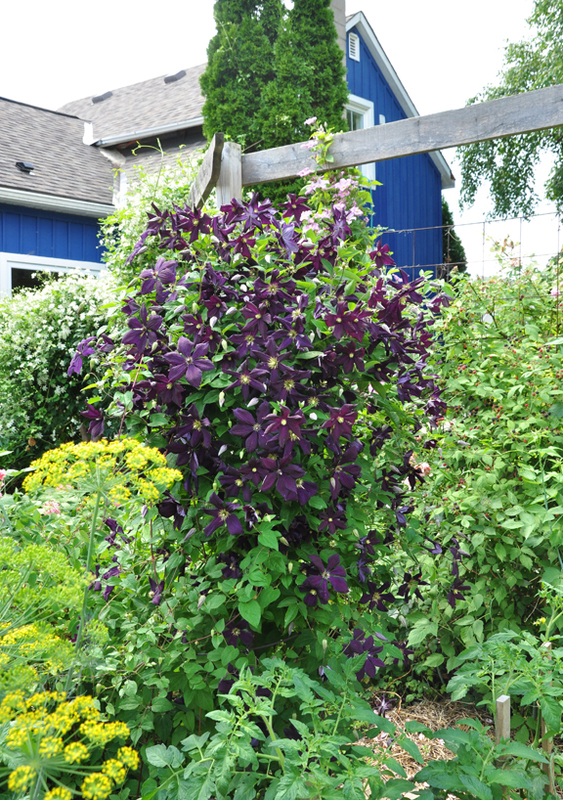 The purple Clematis that you see crawling its way up a Smoke Bush, Cotinus is the first of many such vines we'll see along our way. 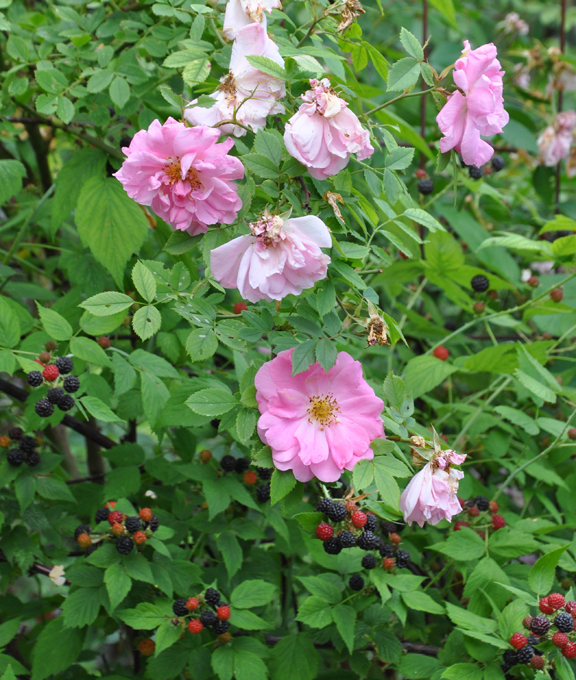 'Invincibelle Spirit' has small, delicate-looking rose flowers. 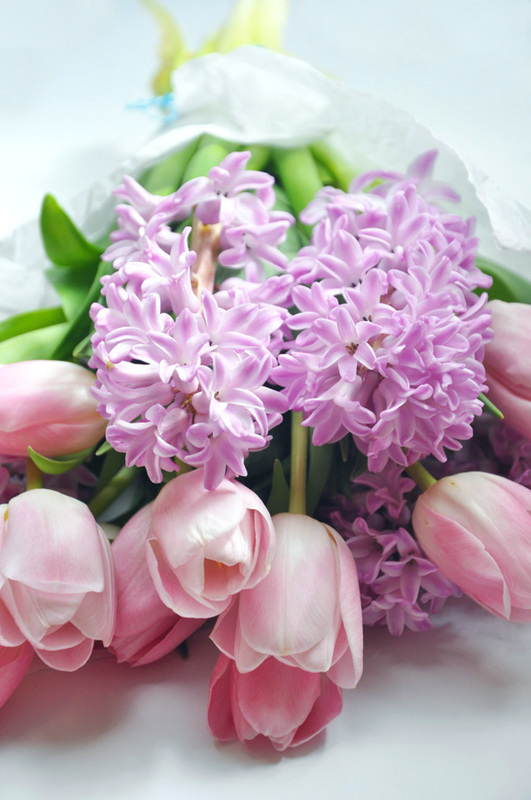 The flower stems are a little fine for holding up such big flowers, but they generally don't require any extra support. 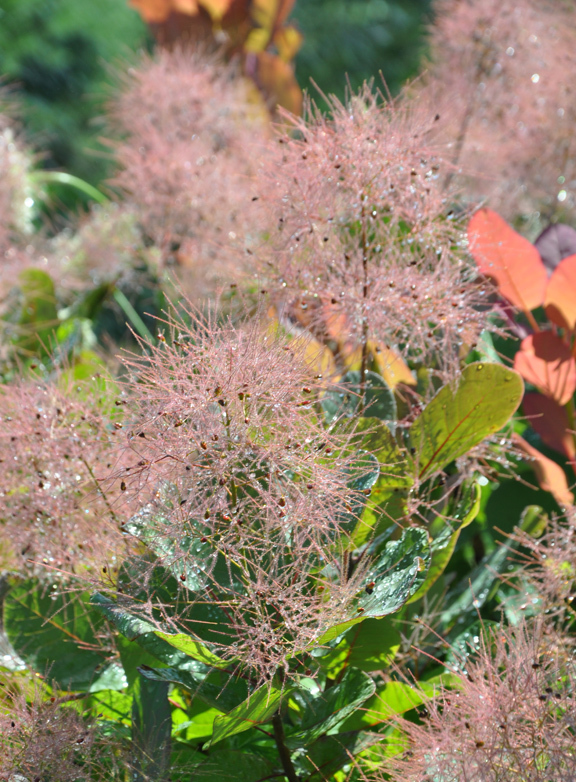 Blooms appear mid-July and carry on into the fall with the flowers fading in color to beige as they age. 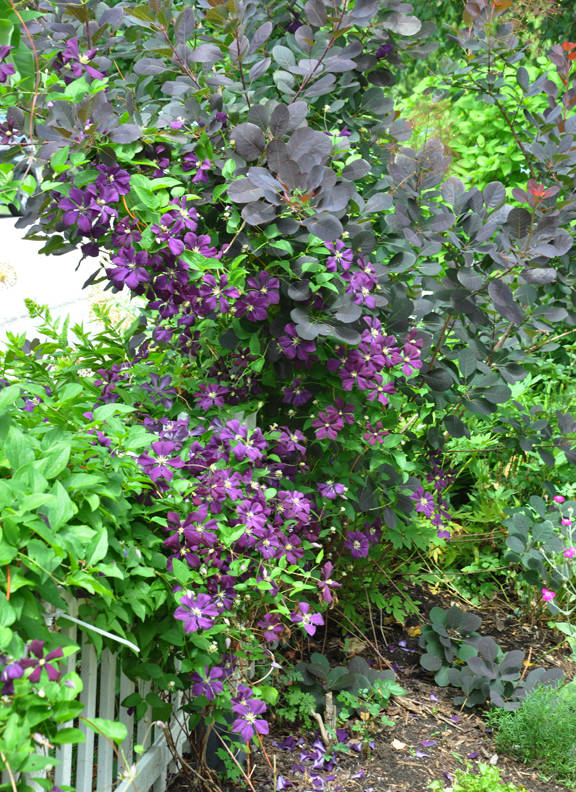 'Invincibelle Spirit' prefers full sun, but will tolerate part shade. 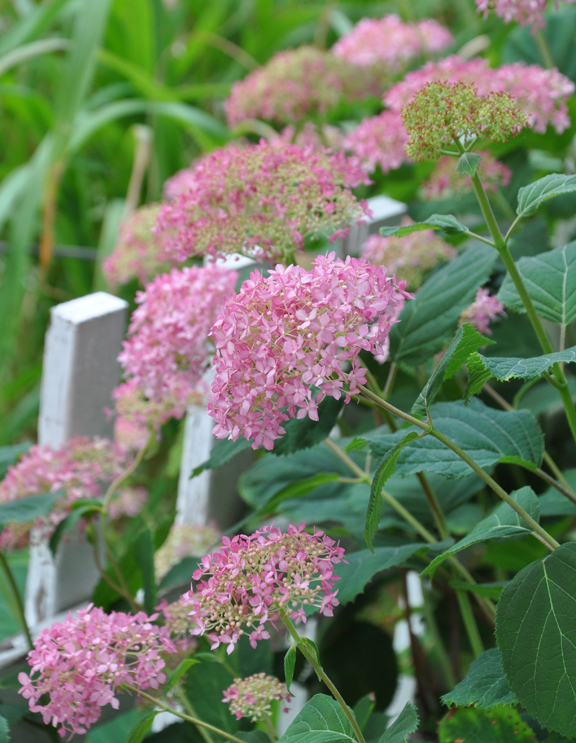 It blooms on new wood, so prune in late winter/early spring. Height: 4-5ft inches. Spread: 4-5ft inches. USDA zones: 3-8. 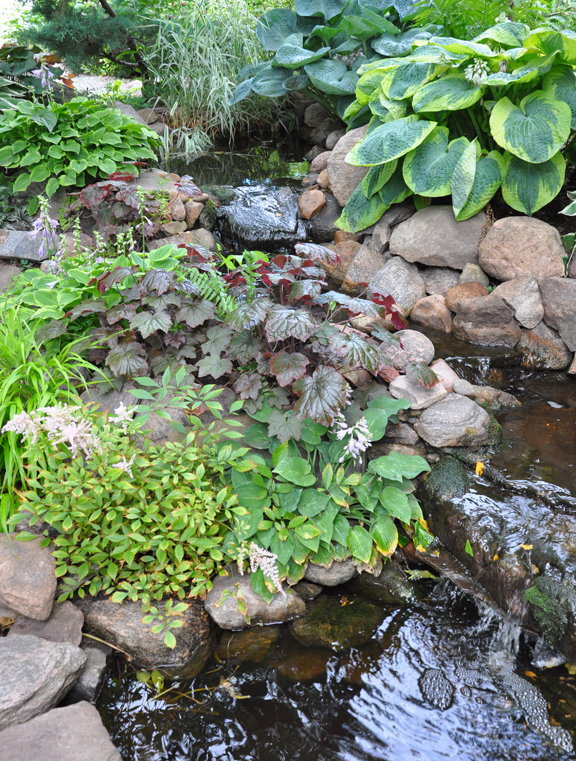 At the far corner of the yard, the path turns and leads to a small pond and waterfall. 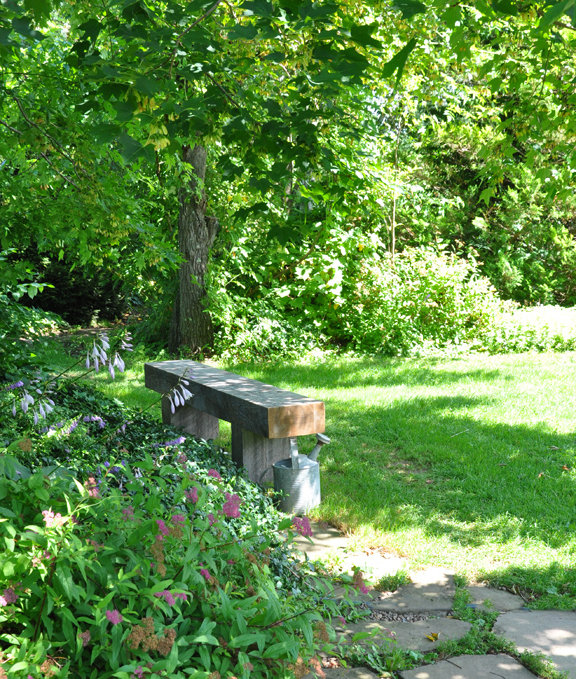 The area to the right of the pond includes a cool, quiet spot to unwind. 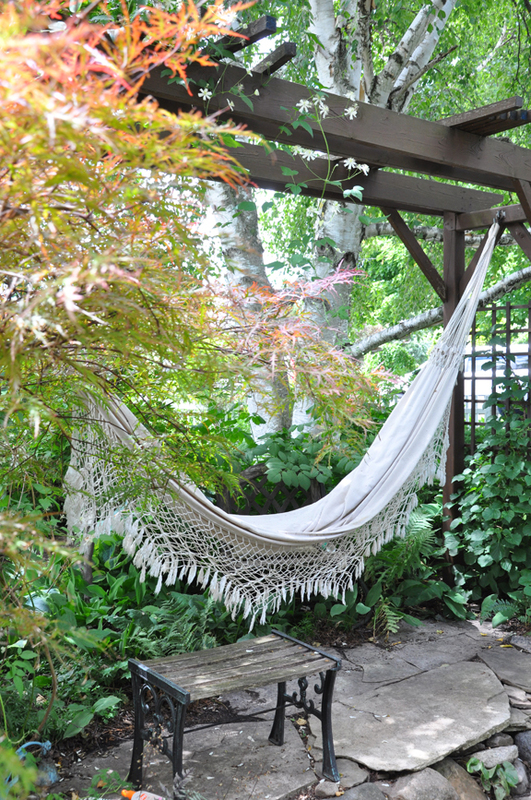 Every gardener needs a place to relax after all that weeding! 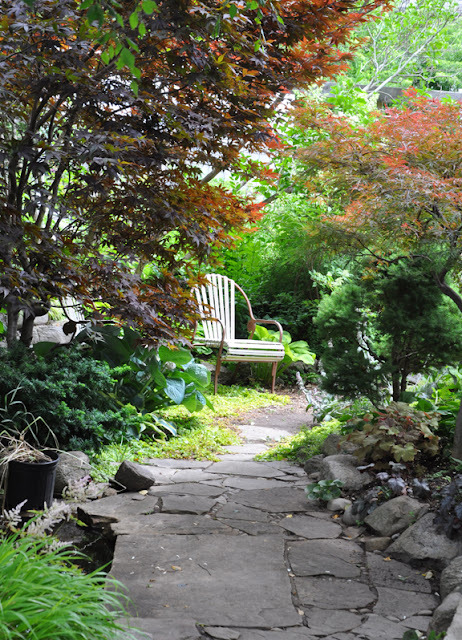 Beyond a Japanese Maple, a chair beckons in the distance. 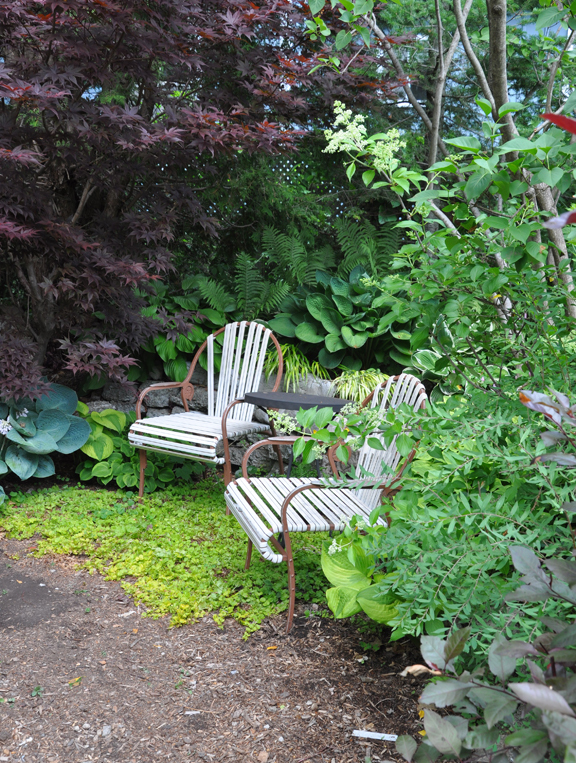 A carpet of Creeping Jenny sits under a pair of chairs. Off a door at the side of the house, there is a raised wooden deck with a bench and a clay fireplace. 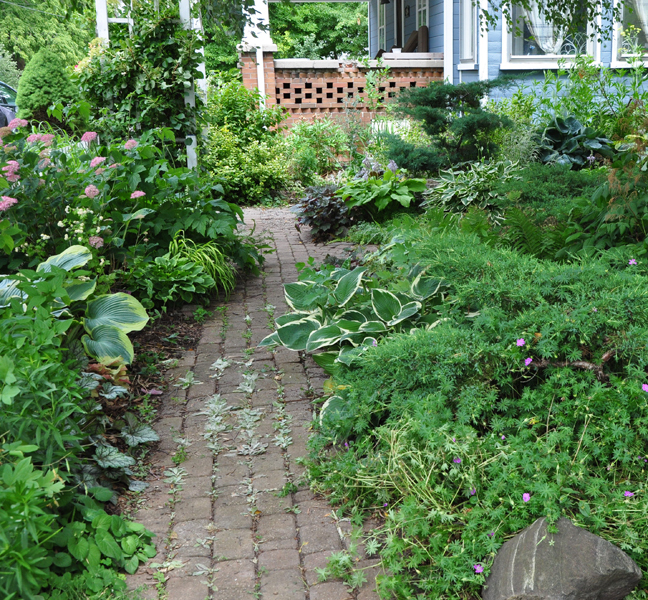 In the righthand corner you can see the hydrangea featured in a photo coming up shortly. 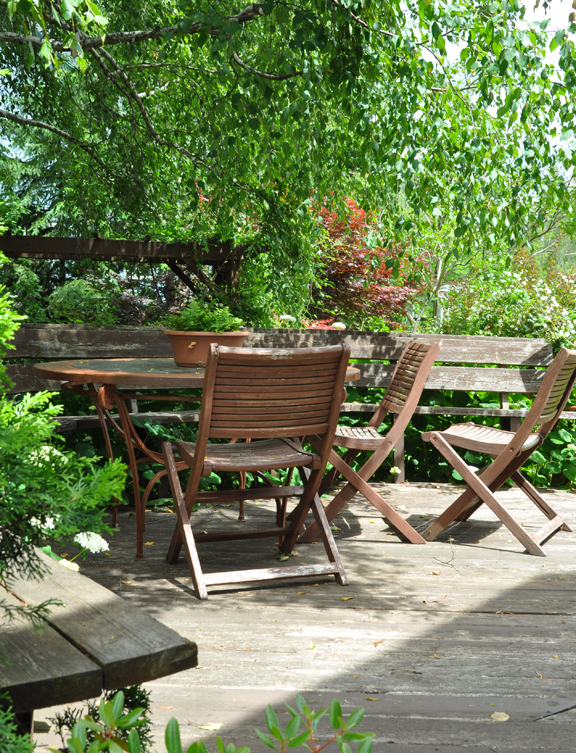 Tucked into a corner of the deck is a table and chairs for outdoor dining. 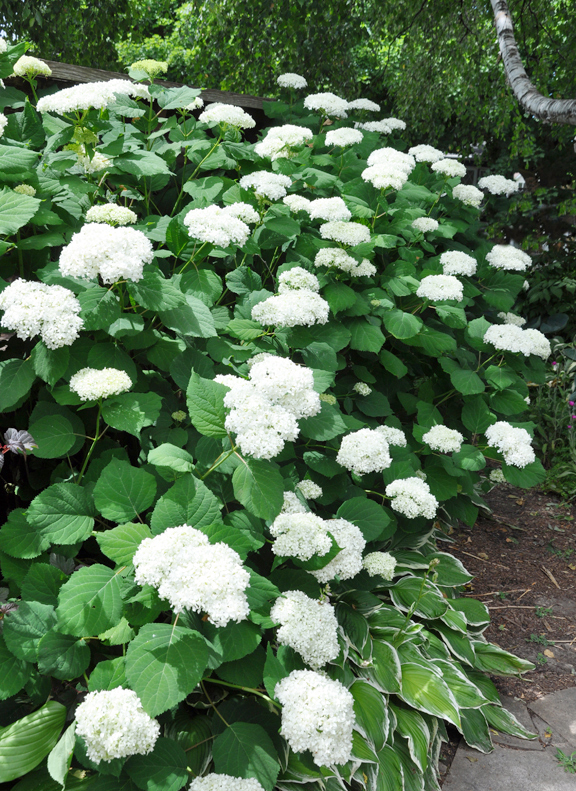 Smooth Hydrangea, Hydrangea arborescens 'Incrediball' has been bred as an improvement on Annabelle and has sturdier stems that don't flop. 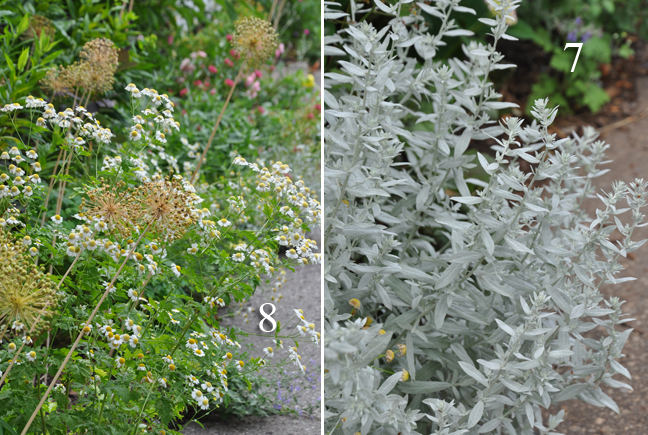 The flowers emerge lime green and age to creamy-white. Height: 4-5ft inches. Full sun. Spread: 4-5ft inches. USDA zones: 4-9.
where "pretty" mixes with "practical". Hindsight has the benefit of experience and experience is the best of teachers. Looking back to when I began this blog seven years ago, I had no idea where it would take me and what I would learn along the way. Last weekend my computer crashed totally. Thank God, I had invested in a remote backup six months ago! It took a full day to restore my files. After the restoration was complete, I discovered that my software no longer functioned. Another day to find the startup discs and reinstall software like Photoshop. Just when I was beginning to feel like things had returned to normal, I was locked out of my email account for most of a day (some weird password issue). And if that wasn't bad enough, suddenly the only sound my iPad seemed capable of generating was static. So here I am at the end of the work week, and I have very little to show for it. Seven years of photography and my poor Mac is groaning with the burden of storing it all. I urgently need to find more storage and clean up my archives. Yesterday, I began the process of deleting some image files. 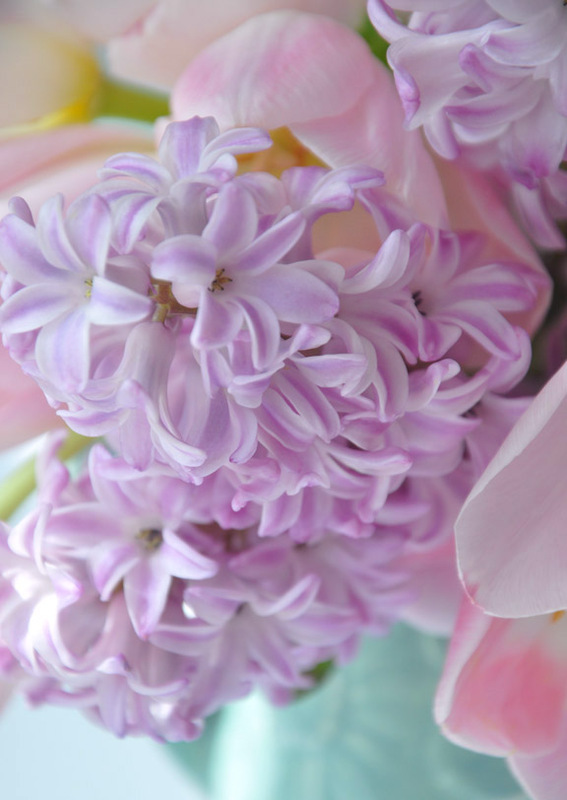 It was funny to look back at pictures that I took in the early days of this blog. Some still make me proud, but others are grit-my-teeth-terrible. I'd love to tell you that I had clear goals when I began this journey, but I didn't. Somehow this blog managed to determine its own direction and I just followed along. 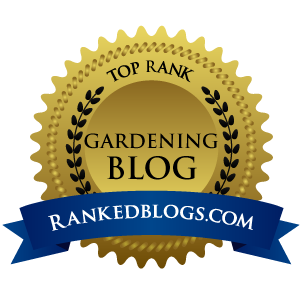 For the most part, the gardens I feature on this blog aren't grand, historic or famous. 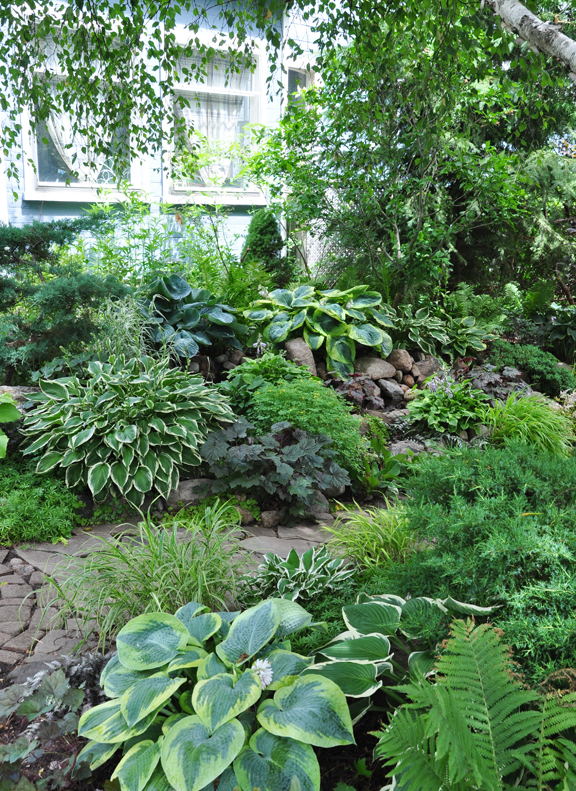 Instead they are the gardens that ordinary people have made. If nothing else, this has taught me that everyday people are capable of creating quite extraordinary things. 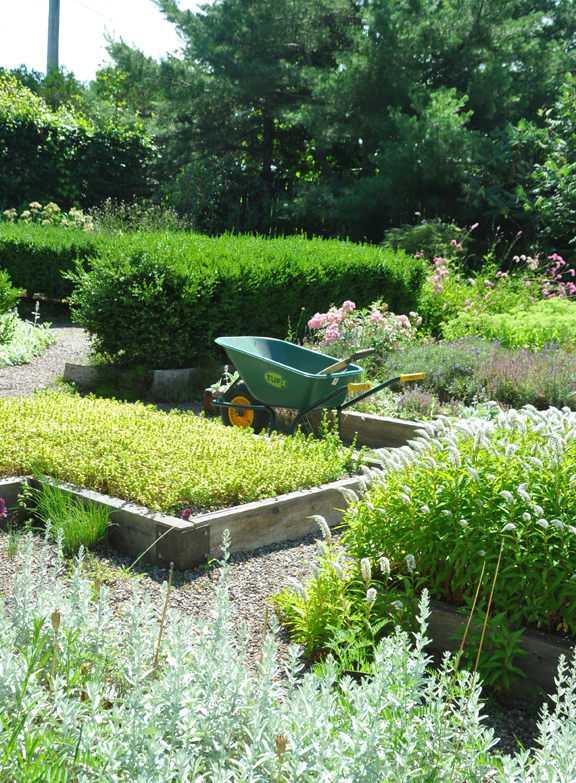 Experience has been a great teacher when it comes to gardening as well. If I could go back in time, I'd council myself to trust my gut instincts more. Too often I overthink things. Sometimes my first idea is my best idea. 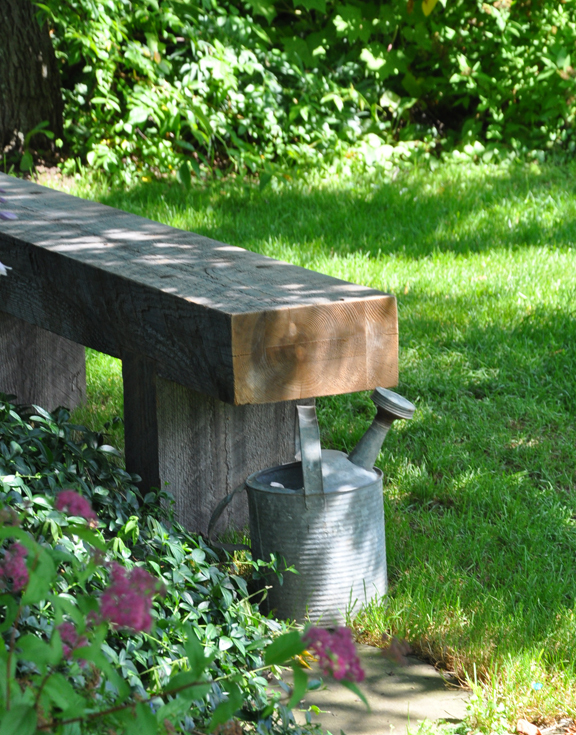 When I first started making my garden, I had a pretty clear idea of what I wanted to create. That clearness of vision hasn't stopped me from having doubts, but even when I have gone off on some new tangent, I have always turned around and retraced my steps back to those first ideas. That initial bit of inspiration continues to serve me well. My only mistake has been questioning it. In hindsight, I rushed into making my garden. I wish I had taken the time to plan a bit more carefully. 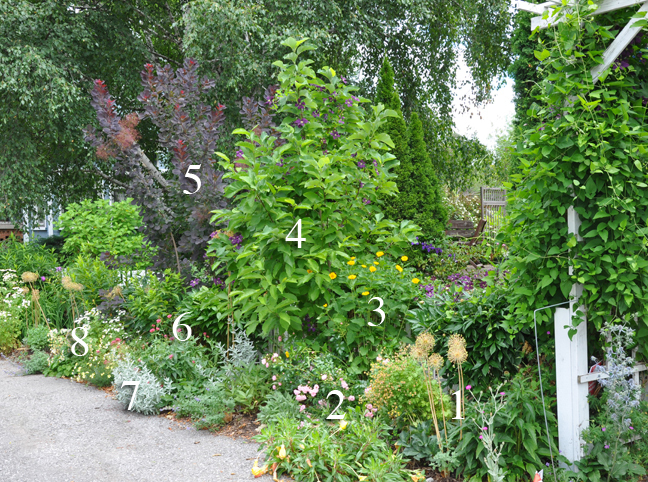 Instead of guessing how much sunlight each area of the garden received, I should have taken the time to make a drawing of the property and make notes on the actual hours of sun each area got. I think I would have been surprised to discover how much shade the house casts on the front garden in the morning and the true impact that each of the tree canopies had on light. 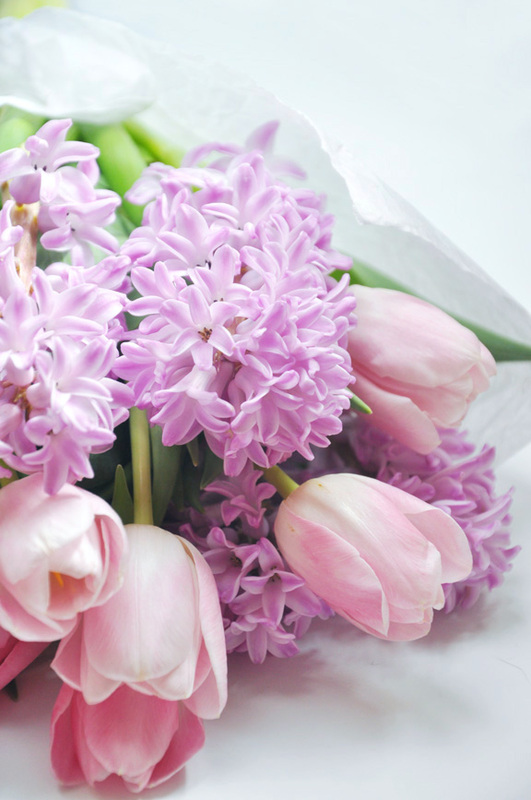 Small failures have taught me to be more realistic about what I really can grow. 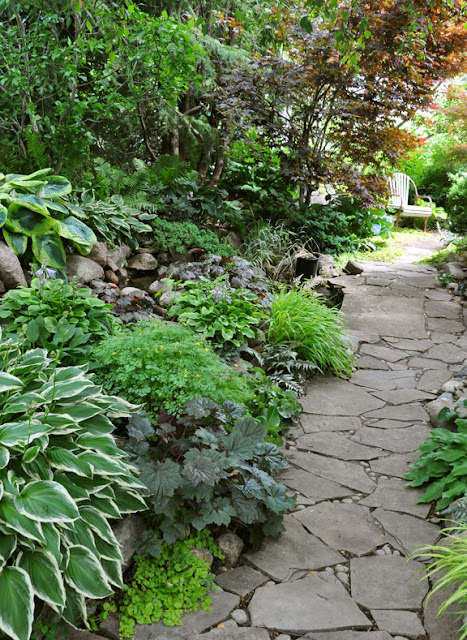 Though I love woodland plants that require moist, loamy soil, they're just never going to prosper in my dry summer garden. Over the years I've come to the conclusion that there is no point in wanting what I can't grow. It is so much better to embrace the conditions I actually have. 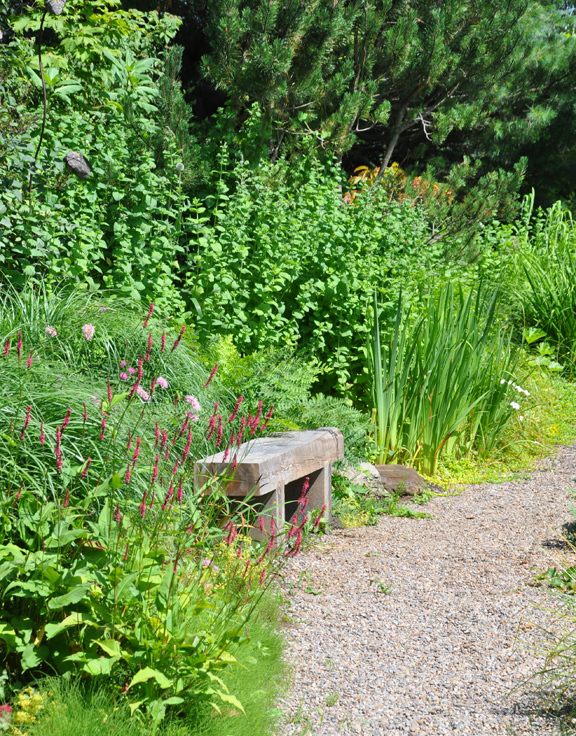 I have also come to realize more and more that a garden starts with the soil. 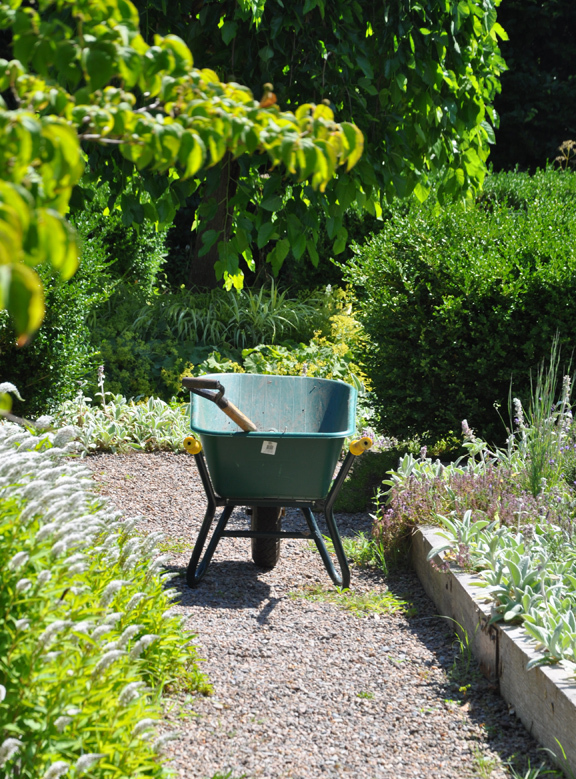 The successful gardeners I so admire feed their soil with compost and leaf mold. 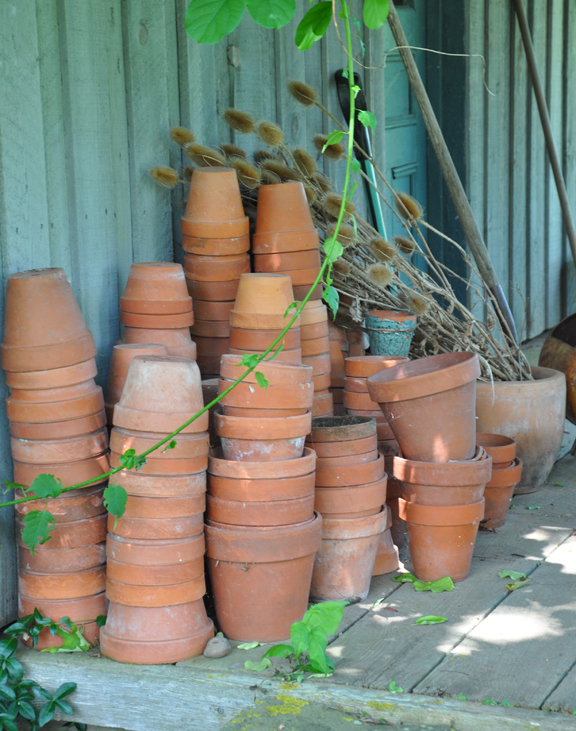 One of the projects I hope to do this spring is an overhaul of the layout of my compost bins. It would have saved me so much money and heartache if I had created a nursery bed for new plants right from the start. In a large garden it is to easy to lose track of new arrivals and miss a critical watering. 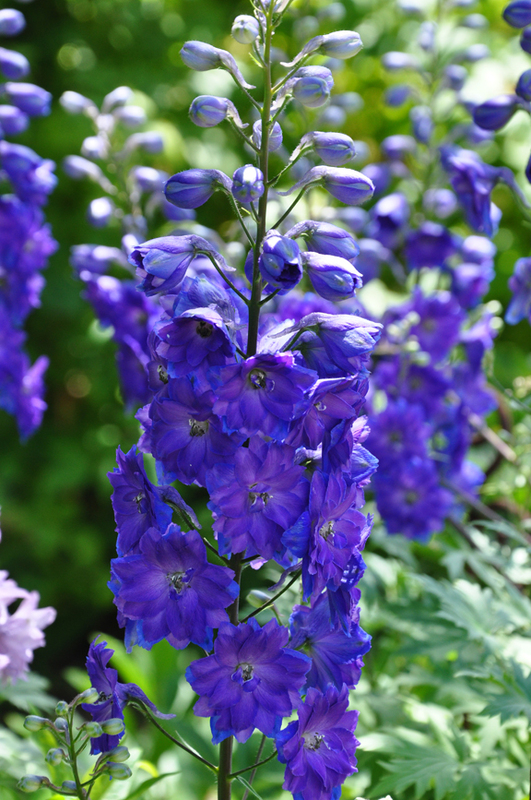 The perennials that you get in those four inch pots dry out so darn quickly even after they've been planted in the soil. My success rate with new plants is so much higher when I gather them into that nursery bed where I can keep a eye on them. 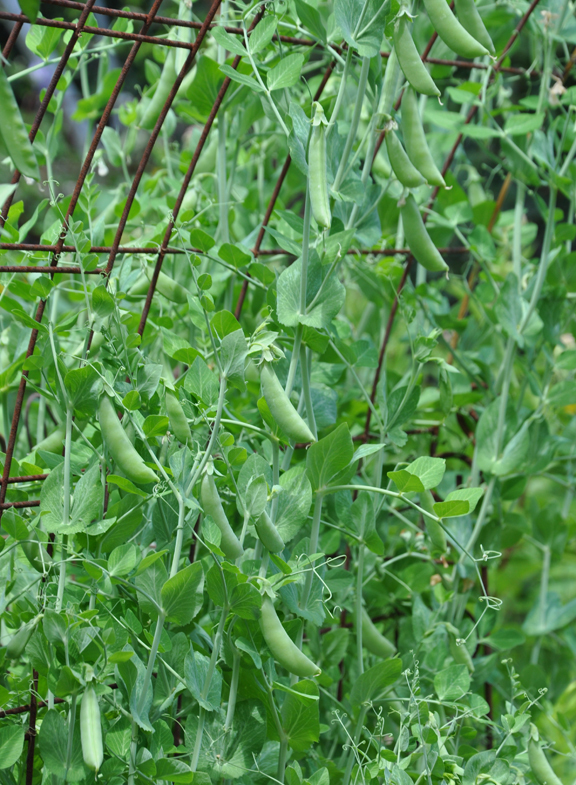 I let them settle in and mature for a season and then plant them out in their final position in the second year. Spring seems to have finally arrived. The other day I saw the first bee of the season visiting the snowdrops that have peeked up out of the soil into the cool air. Then yesterday, when I was walking the dogs, I saw a robin sitting at attention on the neighbour's lawn watching for a meal. 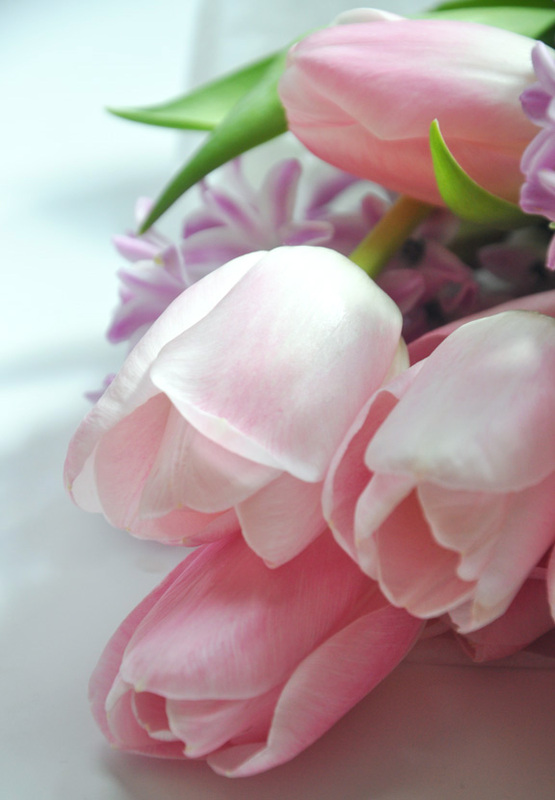 The garden is bare and drab, but experience has taught me not to worry. The garden looks barren now, but give it a few weeks. It's all there waiting for the days to get a bit warmer. Soon it will be as lush and green as my memory assures me it will be. Finally, I want to take this opportunity to say a big thank you. 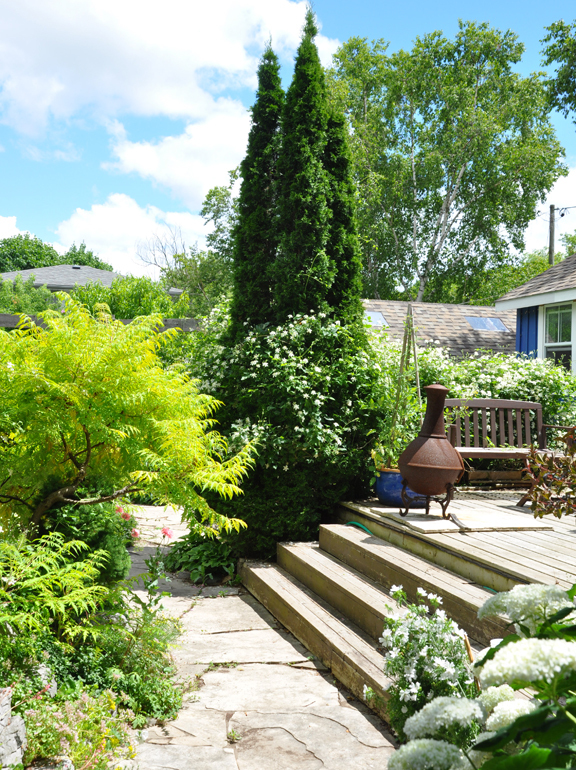 I owe so much to the generosity of the gardeners who have welcomed me into their private spaces and allowed me to photograph their gardens. Thank you all! There are times I feel discouraged, especially when it is almost the first of April and there are still pockets of snow on the ground. But then I will write something that gets a good response or I'll take a picture of which I am proud. Blogging forces me to struggle with my sentences and doing regular blog posts keeps me disciplined. Taking photographs only serves to make me look at things more closely. 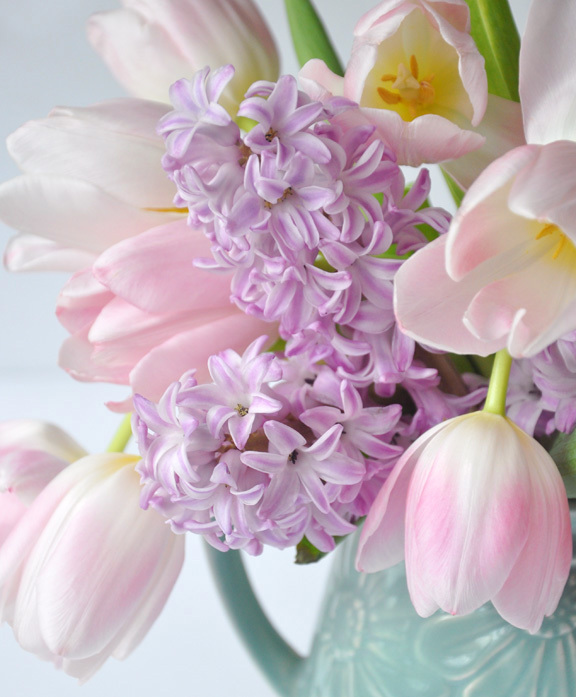 Thank you to everyone who has visited my blog and left or emailed me kind comments. Creating this blog has truly been a pleasure. 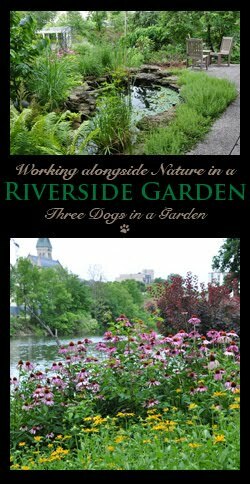 Gardener and entrepreneur are not two words you commonly see used together to describe someone, but both are perfect descriptives for Beverly McClare. For a short while after finishing university, Beverly operated a café in Wolfville, Nova Scotia before she purchased a fixer-upper that sat on an unremarkable bit of land in nearby Grand-Pré. There Beverly began to grow and dry flowers and herbs that she used to make wreaths, which she sold at area craft shows. When the recession hit in the 1990's, Beverly had to rethink her business plan and extend her offering beyond decorative crafts. It was a magazine photo of a herb vinegar that again fired her creative side. 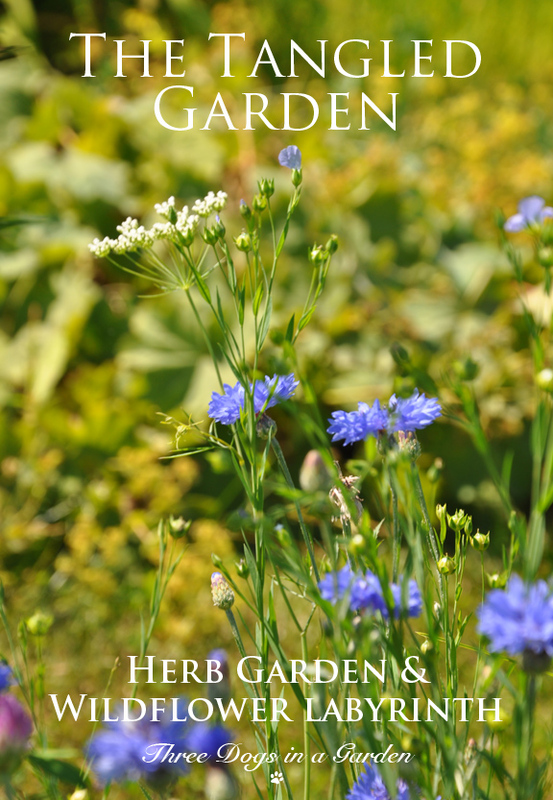 With that image as inspiration, she could envisage the potential of harvesting her own homegrown herbs and making a range of fine foods that she could sell. She began experimenting with unexpected flavour pairings and created a range of herb vinegars. From there, she went on to make the line of herb jellies, which remain the mainstay of her business to this day. The new range of products proved to be very successful. 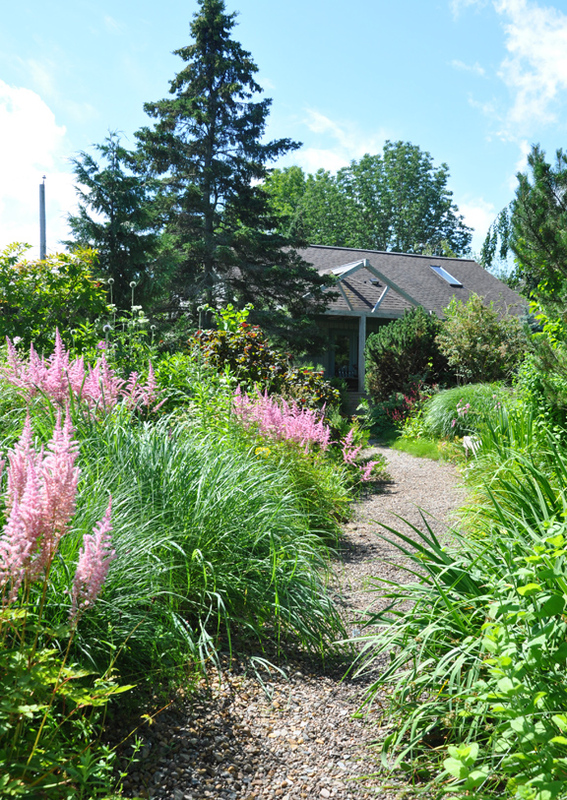 That gave Beverly the funds to purchase additional acreage and expanded what she refers to as her "edible landscape." In more recent years the product range has grown to include oils, mustards, herb-infused honey, syrups, salsas, liqueurs and cordials. 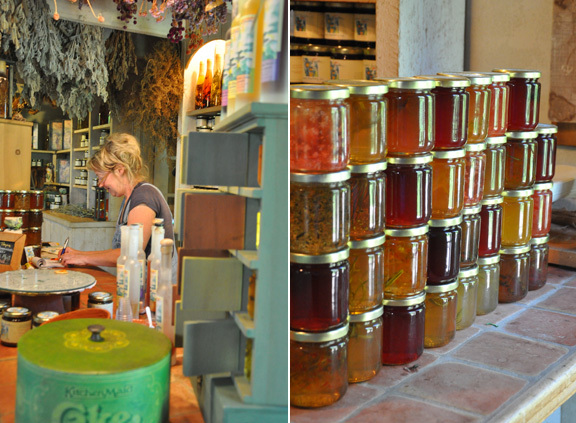 Today there are stacks of herb-infused preserves that glow like jewels in the windows of the Tangled Garden Shop. From wooden ceiling beams, bundles of drying flowers and herbs have been hung to dry. In one corner of the shop, there is a cane chair studded with drying chive blossoms. A chalkboard sign reserves this special spot for gnomes, elves and fairies. 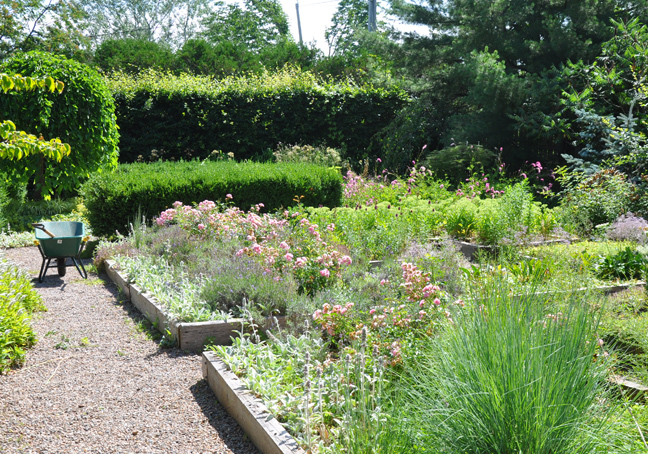 From the gardens that now sprawl over four acres, herbs, berries, fresh fruit and vegetables are harvested, prepared and bottled. Each day one hundred bottles of preserves are produced, six jars at a time. The finished preserves are sold not only in the little shop, but also at artisan shows and online. The extensive garden continued to flourish and Beverly decided to open it to the public for a nominal admission charge. 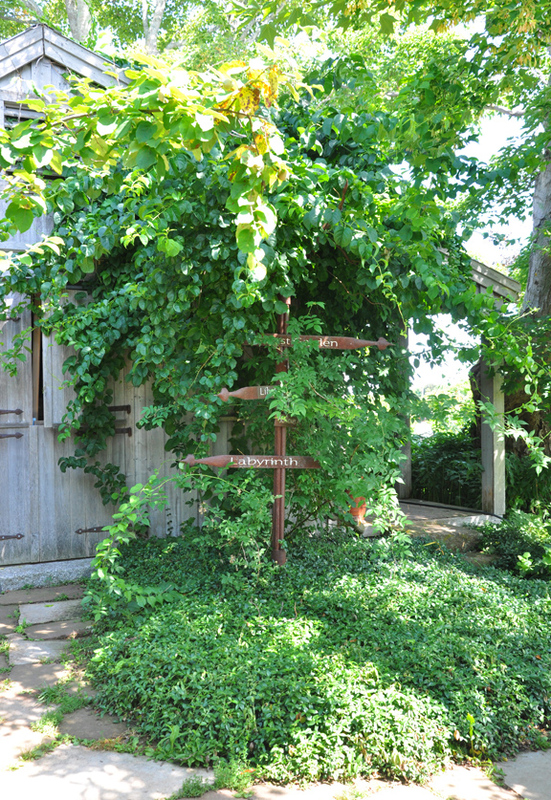 Now thousands of visitors flock to the Tangled Garden each year. 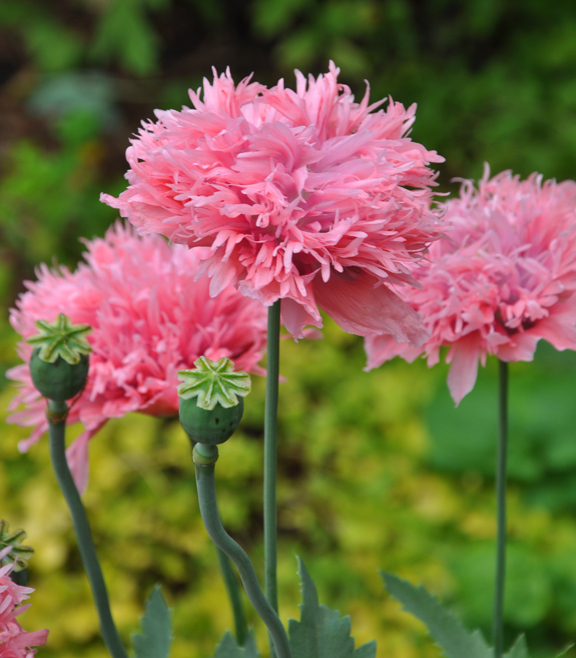 While some plants in the garden are ornamental, the vast majority are harvested for use. Each area of the garden has its own character and special features. 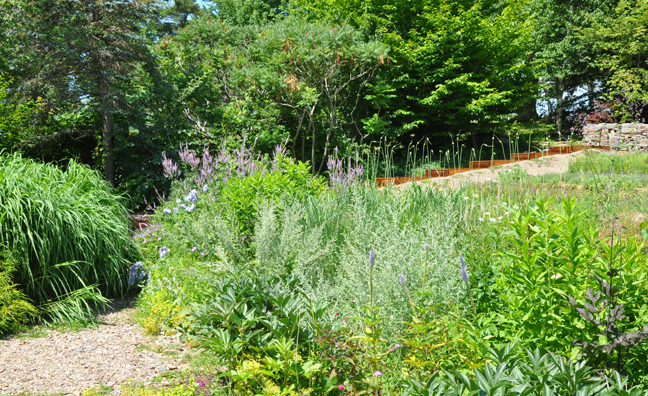 Here the herbs and flowers are planted in a series of raised wooden beds with gravel pathways. 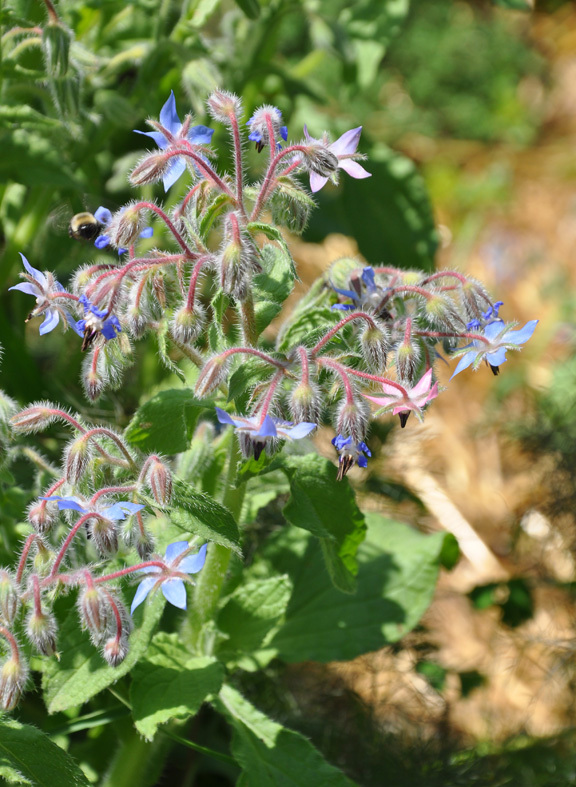 The herb Borage with its pretty blue flowers. 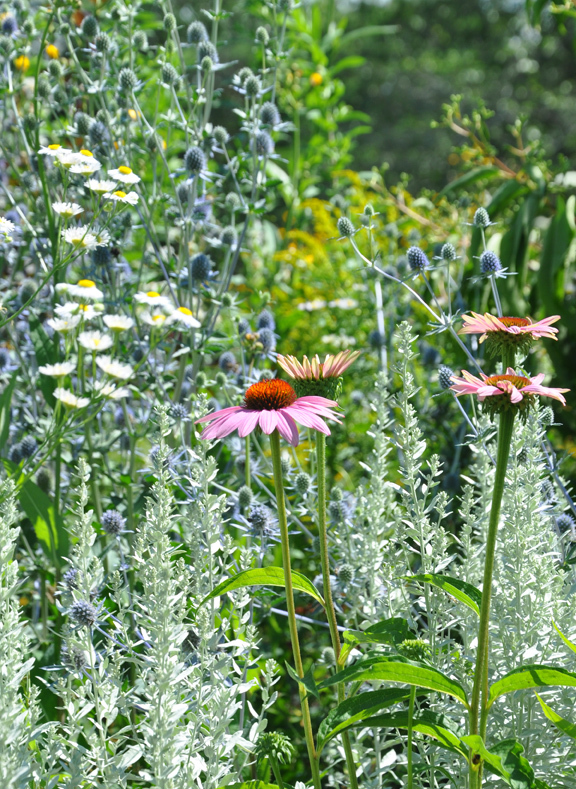 On either side of a dry stream bed, there are tall ornamental grasses, the pink plumes of Queen of the Prairie, pink Coneflowers and blue Sea Holly, Eryngium with its grey-green foliage. 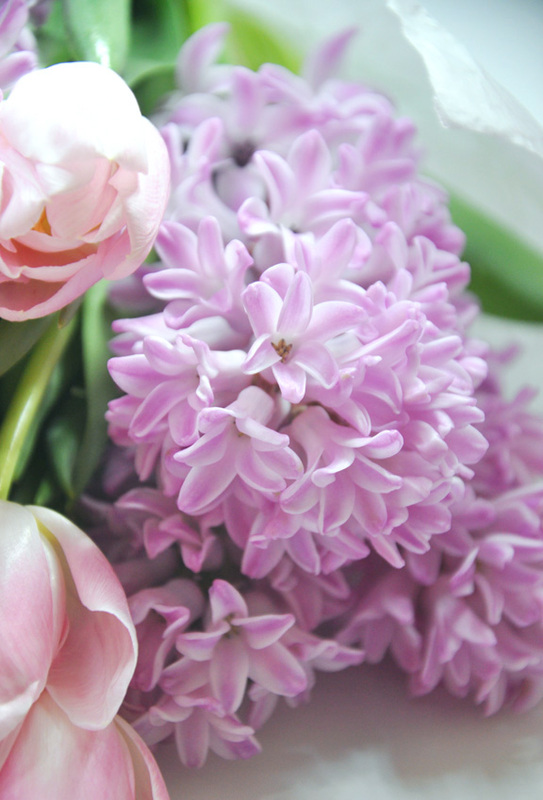 Many of these flowers make it into Beverly's dried arrangements. 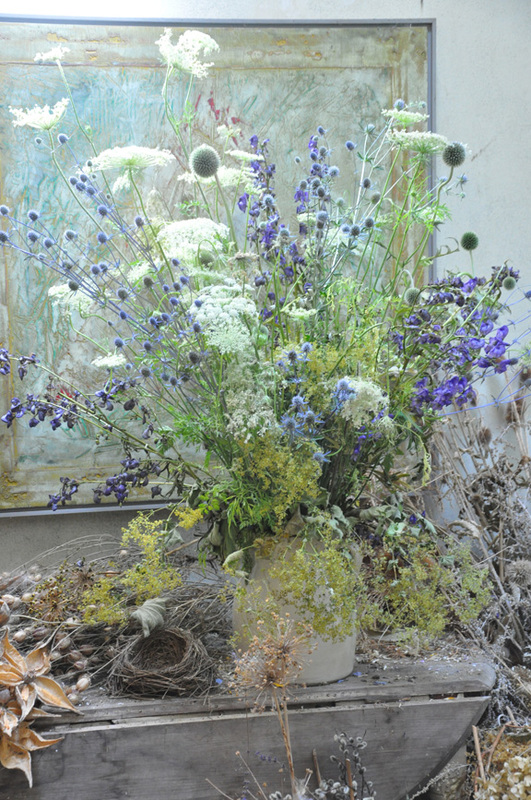 A dried arrangement in the shop. 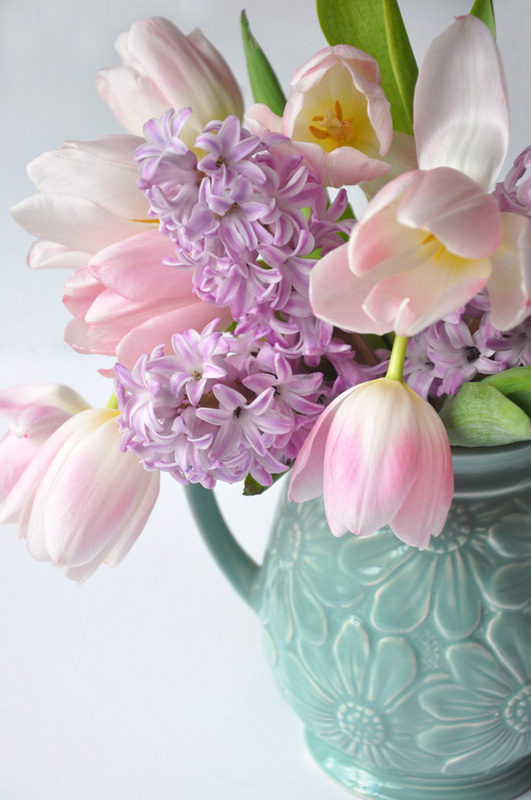 For further information on hanging flowers to dry, read this post: Simple Techniques for Drying Flowers. 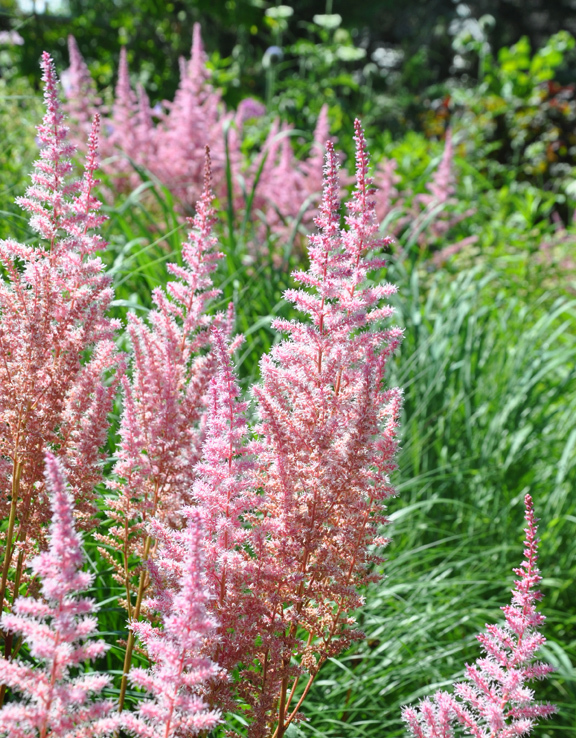 I can't remember ever seeing such tall pink Astilbe. They must love the abundant rain of a wet Nova Scotia spring. and used as a substitute for mint. Looking for ways to experiment with flower petals in your cooking? 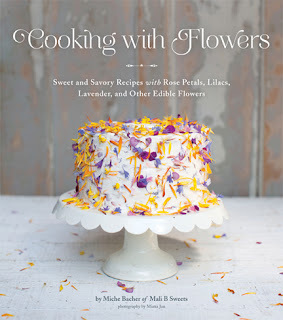 Check out this cookbook. 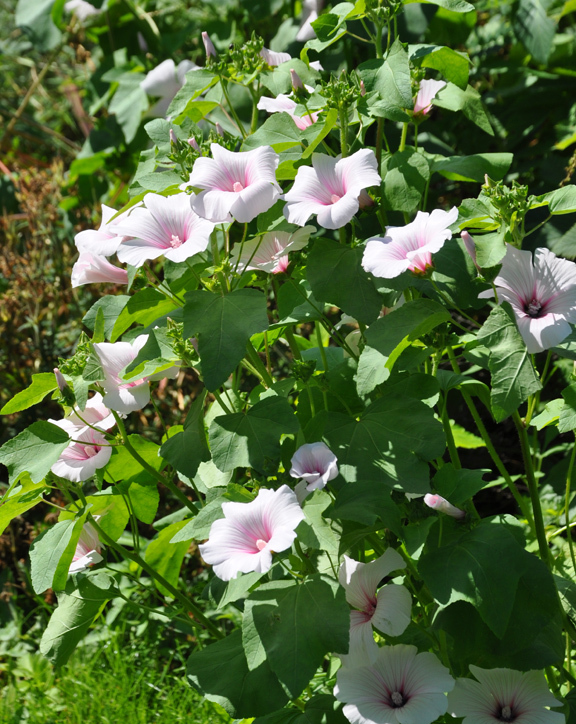 Lavatera, a very pretty annual flower. 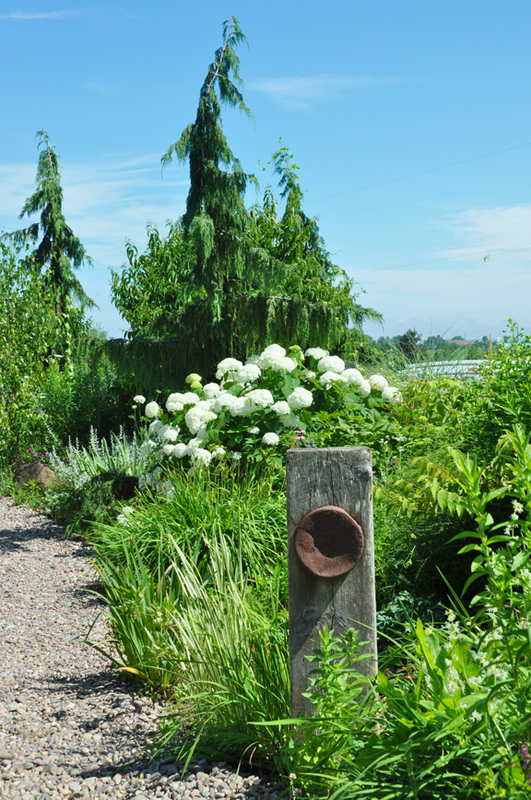 A view of the garden with an Annabelle Hydrangea in the middle distance. 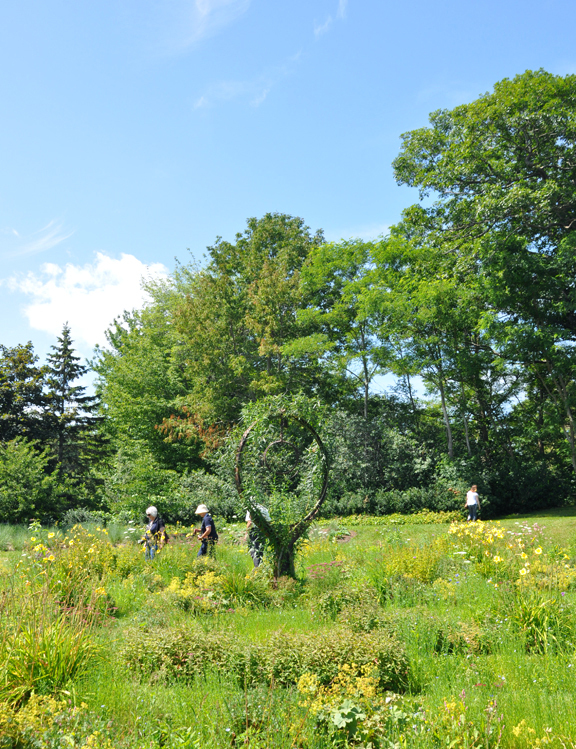 One of the garden's most remarkable features is a flower labyrinth that is 80 feet in diameter. 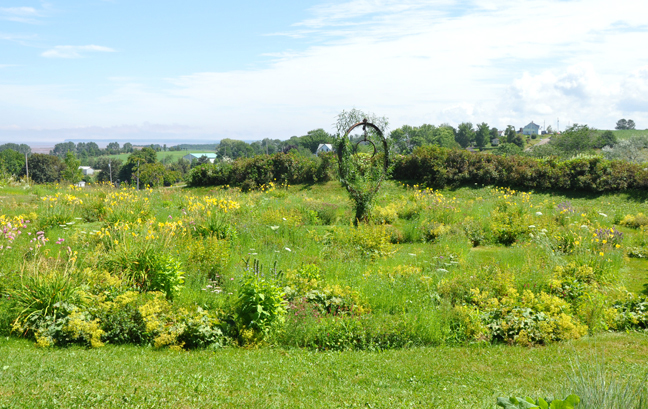 Usually a labyrinth involves some sort of hedge, but here, in an open field with a view of the surrounding countryside, the spirals are floral. Drawing visitors toward the centre of the labyrinth is a large metal sculpture. 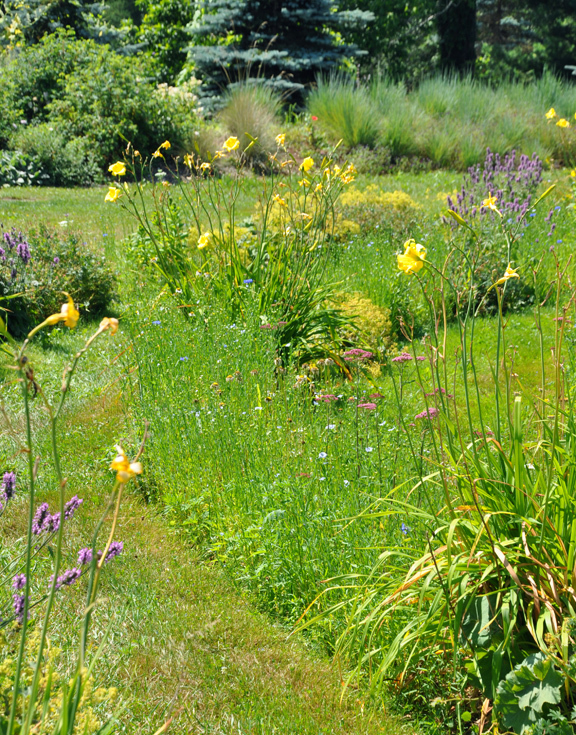 The "walls" of the labyrinth are a mix of plants including yellow daylilies, blue cornflowers, Lady's Mantle, and Betony (purple flowers). 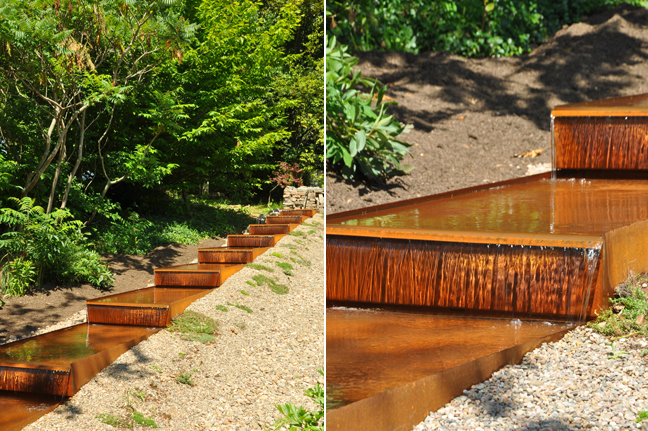 One of the more recent additions is a unique waterfall where water tumbles down a series of steps. Making the herb jellies that the Tangled Garden is especially known for, is a slow process. It takes a full day to chop the fresh-picked herbs, make the sweet or savoury juice and bottle the jelly. 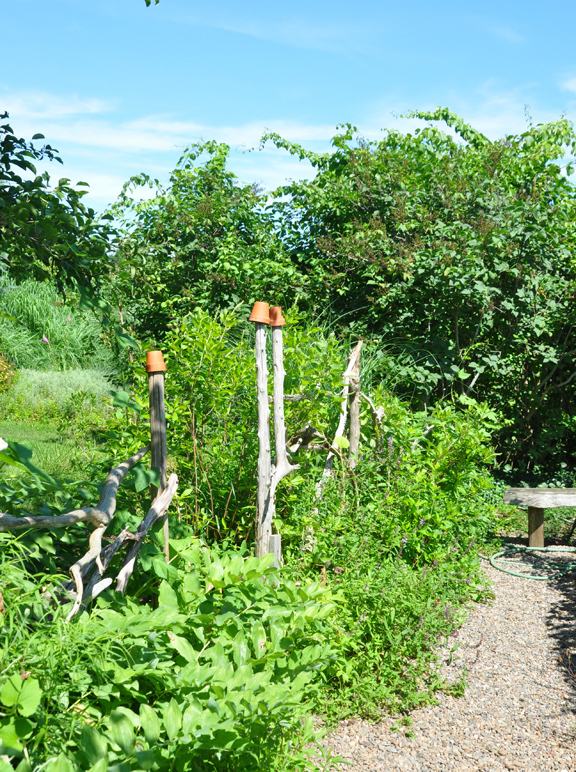 "The garden is soulful to me," says Beverly,"It gives me back so much more than I give it." 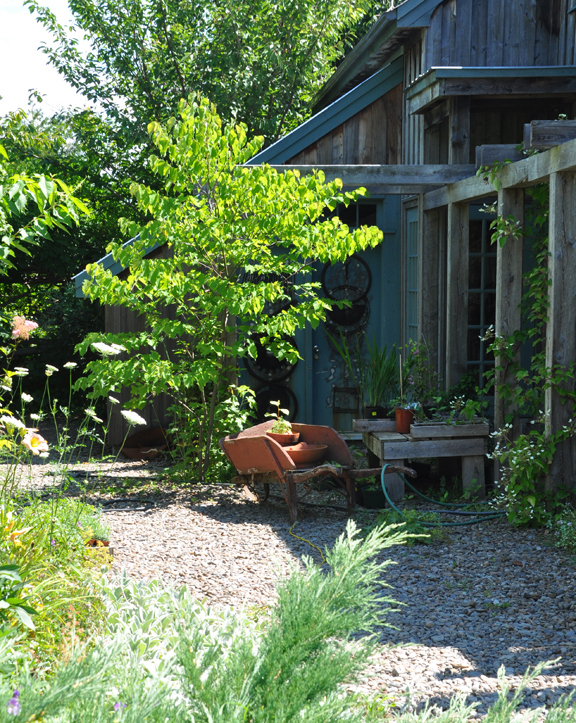 The Tangled Garden Shop is located in Grand-Pré, Nova Scotia. 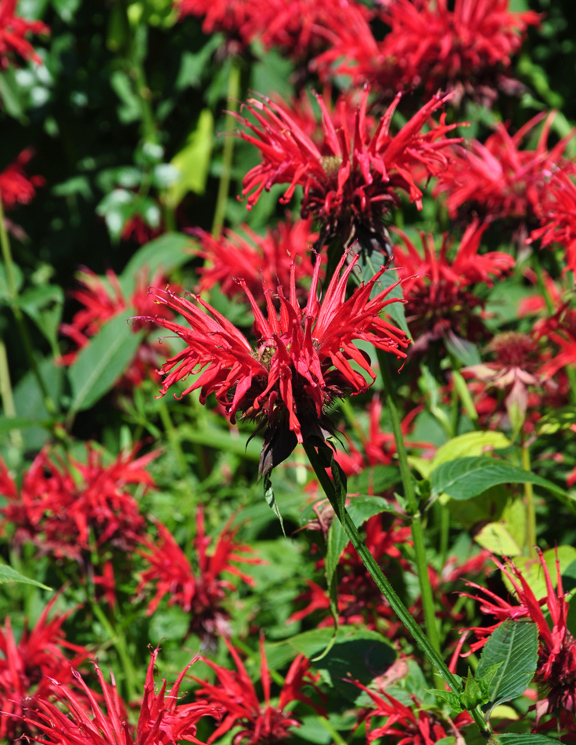 The garden is open to the public with a $5 admission charge, daily from 10 am to 6pm from April to December. For more details visit the Tangled Garden website.